There is no app on this page, just a discussion of a key issue for anyone working with polymers. 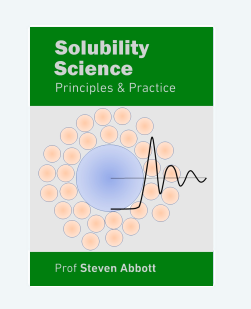 If your polymers are not entangled then they are low viscosity, easy to work with and generally weak and poorly adhered. If they are entangled then they are harder to work with, but much more useful. The aim here is for you to understand this trade-off between ease of handling and end-user properties that many formulators make unaware of what's going on. Entanglement of polymers is key to many features of polymers, good and bad. If polymer chains are simply "intermingled" nothing much happens. For example, in solution polymer chains will touch each other and increase viscosity, but not dramatically. And in the polymer melt as you increase the MWt the viscosity goes up (not surprisingly) but, again, not dramatically. If you have polymer chains crossing an interface you get a significant boost to adhesion (much larger than surface energy), but it's not dramatic. Everything changes once the chains can tangle. Imagine a stiff rope, a laptop power supply cable and the thin cable for the headphones for your smartphone. If you jumble them up, the stiff rope remains stiff, the laptop cable sometimes gets into a tangle which is a bit difficult to pull apart and the thin headphone cable seems to tangle whatever you do. And once you have a tangle, the harder you pull to untangle it, the worse it gets. The longer the length of any of these, the more likely it is that you will get a tangle. This is exactly the case for polymer chains. A short and/or stiff polymer chain hardly tangles so it's very easy to pull the chains apart in solution/melt or across an interface. But long and/or thin, they tangle and pulling them apart in solution/melt or across an interface is difficult, giving high viscosity and adhesion. The definition of entanglement is surprisingly simple: if the chain crosses an arbitrary plane 3 times then it is entangled. This is real polymer physics, not some simplistic guide. In the image the crossings are marked with a *. Imagine if the chain was shorter and crossed only two times. You can imagine pulling half way along the chain and both ends will come out with no problem. But if you have three crossings, if you pull up at one place, it will trap another polymer chain at a different place. The reason a given length of rope is harder to tangle than a headphone cable is that being much stiffer it takes a much longer length before it can cross a plane three times. 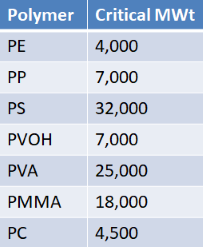 Indeed, different polymers have very different values of Mc, as the table shows. These, in turn, have important effects on the polymer properties. For example, PMMA has a high Mc and is notorious for not being tough - you can easily snap it. The same is true for polystyrene (PS) and polyvinyl acetate (PVA). But at the other extreme is polycarbonate (PC) with a very low Mc. This means that for a modest MWt you have a lot of entanglements and PC is very tough. People often wonder why they don't substitute the bisphenol-A in PC for some other diol, to avoid the stigma of bisphenol-A. The reason is that just about any other diol gives a polycarbonate with a much higher Mc and therefore much lower toughness. Of course Mc doesn't explain everything about toughness, crystallinity also plays a role, but it's certainly a contributing factor. Sadly for formulators there are, as yet, no easy ways to predict Mc for a given polymer so you have to do tedious experiments with batches of different (and narrow) MWts in order to find whether your polymer is easy to tangle or not. We can see the dramatic effect of entanglement with this log plot of melt viscosity versus MWt. A steady increase of MWt gives a linear increase in viscosity (this is the Rouse mode). Then suddenly at Mc, the Critical Entanglement Weight, viscosity increases by MWt3.4 when we are in the Entangled mode. 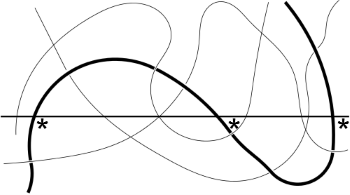 A similar curve can be found for dependence of solution viscosity on concentration. These sudden onsets of strong viscosity changes can be a disaster for a formulator. The people in Production will generally prefer polymers below the critical entanglement MWt or concentration because they are easier to handle. But formulations are often much better when the chains are entangled - giving, for example, greater strength/toughness or adhesion. It is, therefore, very important that both Production and the formulations team understand where they are in terms of entanglement so that a rational compromise can be attained. Entanglement affects many areas of polymer physics and formulations yet is relatively unfamiliar to many outside the polymer physics community. Once you get used to thinking about it, you find it everywhere. 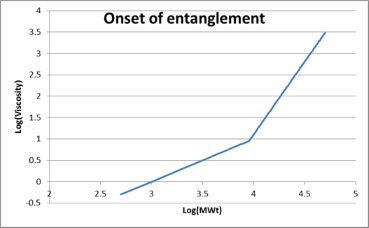 And another way to get entanglement is via light crosslinking. Indeed, in terms of basic physics there is no difference between conventional and crosslinked entanglements, except when the polymer is strongly stretched in which case the crosslink tangles show themselves as more rubbery than conventional tangles.